Auburn opened as a 4.5-point favorite at the Westgate but the line went to -3 on Christmas Day thanks in part to a $55,000 bet on the Boilermakers. But as it turns out, Auburn is actually capable of playing well in a "meaningless" bowl game. Turns out, Auburn is actually capable of playing well in a "meaningless" bowl game. All UCF heard this season was that the Tigers didn't actually care about playing in the Peach Bowl after losing in the SEC Championship because it was beneath their lofty standards. The Golden Knights upset Auburn then but the Tigers weren't going to settle for a repeat in Friday's Music City Bowl against Purdue. Although the majority of spread tickets were on the Tigers across the betting market, money moved the line in Purdue's favor, indicating sharp action on the Boilers. 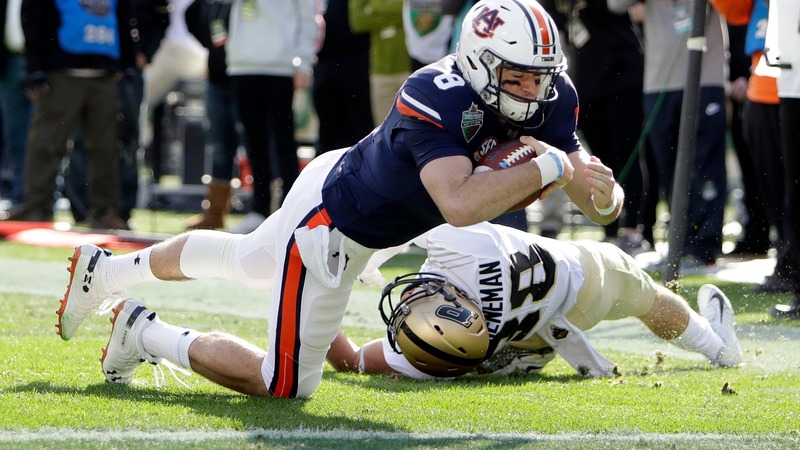 Auburn opened as a 4.5-point favorite at the Westgate but the line went to -3 on Christmas Day thanks in part to a $55,000 bet on the Boilermakers, oddsmaker Ed Salmons told BetChicago. __MORE:__ [Bigger money laying the points with Alabama over Oklahoma in Orange Bowl](https://www.betchicago.com/cfp-betting-odds-alabama-oklahoma-orange-bowl) Unfortunately for the bettor and the Purdue faithful, they were in for a shock from the third play of the game on. Auburn QB Jarrett Stidham hit RB JaTarvious Whitlow on a wheel route for a 66-yard scoring play which would turn out to be the first of Whitlow's three touchdowns of the game. <a href="https://www.clippituser.tv/c/bnpmgq" class="embedly-card" data-card-width="100%" data-card-controls="0">Embedded content: https://www.clippituser.tv/c/bnpmgq</a> Auburn went on to score TDs on its first eight possessions and tied Music City Bowl records for most points and TDs set by West Virginia in 2000 — with 5:36 remaining in the first half. By halftime, the Tigers were up 56-7 with the most points scored in any half in program history after holding the ball for only 11 minutes. Safe to say the Tigers hit the OVER (55.5) themselves in the 63-14 romp as Stidham threw for 373 yards and five touchdowns and had only one three-and-out late in the third quarter. __Also:__ [Clemson suspensions not swaying bettors in Cotton Bowl](https://www.betchicago.com/cotton-bowl-betting-lines-trends-predictions-notre-dame-clemson-suspensions) Make sure to check back here with BetChicago for a full recap of bad beats, crazy finishes and everything that happened in Friday's bowl games. Next up is Syracuse-West Virginia from Orlando, followed by Iowa State and Washington State in the Alamo Bowl. Big bets have been coming in the Orange since West Virginia QB Will Grier announced he would skip the Camping World Bowl to prepare for the NFL Draft. <a href="https://twitter.com/Covers_Vegas/status/1078774641290731525" class="embedly-card" data-card-width="100%" data-card-controls="0">Embedded content: https://twitter.com/Covers_Vegas/status/1078774641290731525</a> __Free contests:__ [Win $5,000, Bears playoff tickets and prize packs](https://betchicago.chalkline.com/) ## Syracuse pulls away late to cash for public bettors The line never stopped moving away from Syracuse once West Virginia quarterback Will Grier announced he'd be sitting out as he prepares for the NFL Draft. The Orange opened as an underdog but closed at most shops as a 3-point favorite. Syracuse used a big fourth quarter to pull away from the Mountaineers for a 34-18 victory. West Virginia took an 18-17 lead into the 4th quarter, but Syracuse scored six seconds in to take a 24-18 lead. On the first play of the next possession, Mountaineers quarterback Jack Allison threw an interception that was returned inside the WVU 20. The Orange converted a field goal for a 27-18 lead. A three-and-out for West Virginia turned into another Syracuse touchdown and 34-18 lead. Any chance at a backdoor cover was lost when West Virginia failed to get points inside the Syracuse 5. The Mountaineers turned it over on downs with 6:12 remaining. The total stayed UNDER, meaning the OVER is 11-9-1 in bowl games this year. ## Iowa State covers for most Depending where you shop, Iowa State could be found anywhere from 3-point underdogs to getting 1.5. For most, it closed at 2.5, which means the Cyclones added to the poor betting history of Washington State head coach Mike Leach in a 28-26 Cougars win in the Alamo Bowl. Leach entered on a 1-7 ATS run in bowl games and was 1-3 straight up at Washington State. But the Cougars held off an Iowa State rally to win a school-record 11 games.